Throw roll links to activities that require fielding, throwing and catching and can lead on to softball, baseball, cricket and tee ball. The group line up approximately 4 metres apart and facing one another. Players facing each other become a pair and work together. 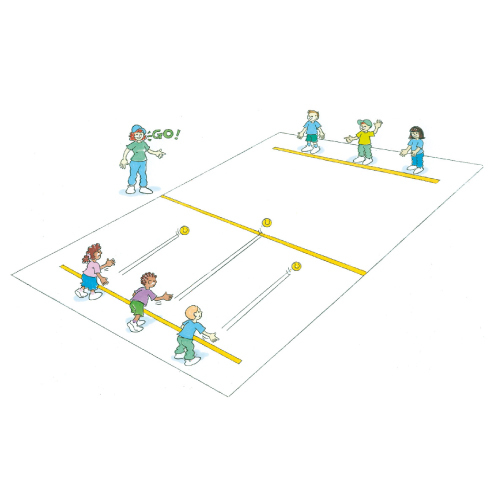 The coach decides which is done first – roll or throw and decides which games to play first, eg first to 10 or how many are completed in a set time. When deciding, players roll ground balls to each other making sure not to fumble; or throw a ball to each other making sure they don’t drop it. Can you show me how you should stand when you are waiting to field the ball? Where should we aim when throwing the ball to your partner?